Today, after my third trip to Migracion in as many weeks, I picked up my official Residente Permanente card granted by the federal government of Mexico. I was surprised at myself: I couldn’t stop smiling. I’m thrilled, in fact, to now be an official part of this country I call home most of the year. That’s not to say that the USA is not my home. I am a citizen, I vote, I take part in my community, I own property that I return to often, my family is there and I have a deep friendship network. I know my final resting place — in Santa Cruz, California, in a redwood grove, next to our mother, the Pacific Ocean in the distance. There is much to appreciate in these two worlds — Estados Unidos Mexicanos and the United States of America. Neither is perfect. At the moment, I am happy to have focus here away from the turmoil of nationhood that has gone awry in my home country. As a friend recently said, we live in an imperfect world. 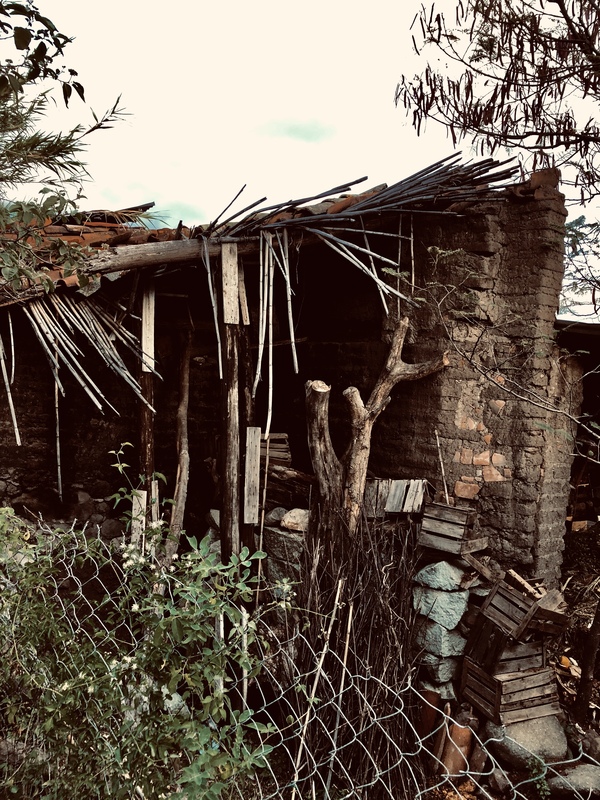 There is solace living in a small Zapotec village thirty minutes from a smallish town that is rich in cultural heritage and indigenous traditions. I made this decision to apply for a permanent residence in September after I was invited to contribute a chapter to a book featuring the voices of women in the United States who have chosen to live in Mexico. 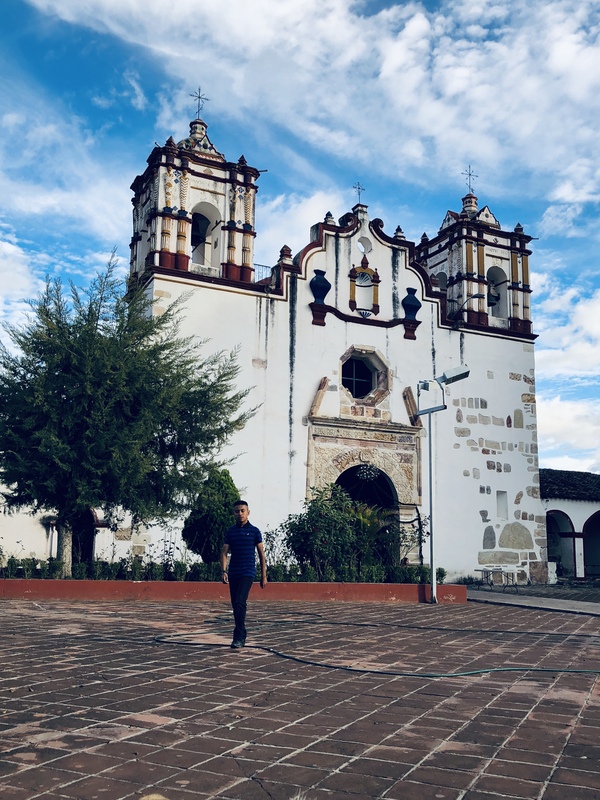 I wrote almost 4,000 words about how I first came here, what kept me coming back, and the difference that living in Mexico has made in my life. As an exercise in self-reflection, I realized how meaningful life here is for me, my relationships with people who come from an 8,000 year old heritage, and how my creativity is energized by the experience. When I got to North Carolina in October, the first thing I did was contact the Mexican Consulate in Raleigh to make my application and arrange a personal interview. I was welcomed and treated with respect. I know that Mexicans do not have a similar experience when they appear for their appointments at the U.S. Embassy in Mexico City to apply for a simple tourist visa. The paperwork required is extensive: one year of printed bank records documenting income to meet a threshold to qualify for this type of visa. I did not tell them anything about me in advance and I did not bring a resume. They must have found this blog and while at the interview invited me to meet with the cultural attache to talk about ways we could work together to educate Carolinians about the artistic and cultural richness of Mexico and her people. I received the preliminary approval with a stamp in my Passport within two hours. That was just the beginning. 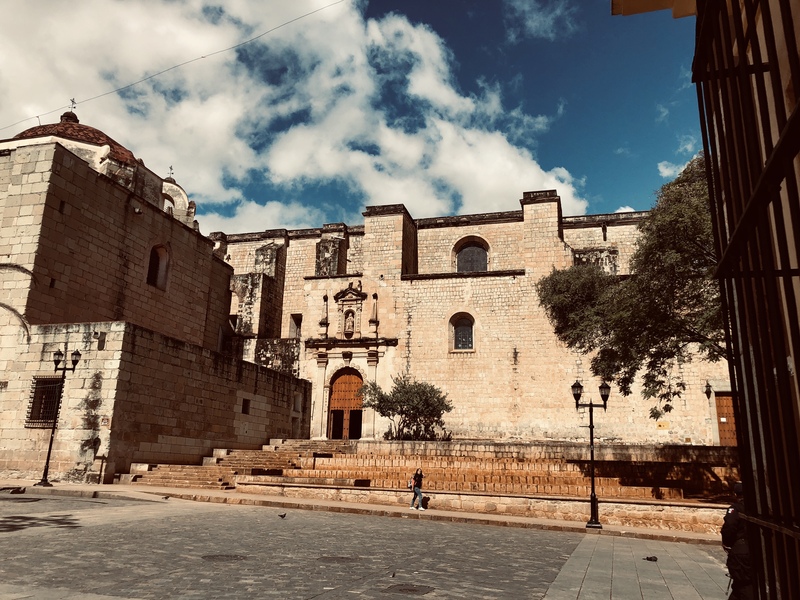 Then, in Oaxaca, on recommendation from friends, I hired German Osorio, a very helpful English-speaking attorney who facilitated another application, payment of a fee, and the series of meetings with officials to complete the process that took several weeks. This included surrendering my Passport for several days, surrendering my Tourist Visa permanently. Without the Tourist Visa, I could not leave the country until the Permanent Resident Visa process was complete. Not much will change for me with this Permanent Resident Visa, except that the official approval solidifies my commitment to people and place. I woke up early with the wind at my back, ready to get a jump on the Day of Giving Thanks. In Mexico we call it Dia de Accion de Gracias. It is a good day to take a walk and think about all the goodness of life. 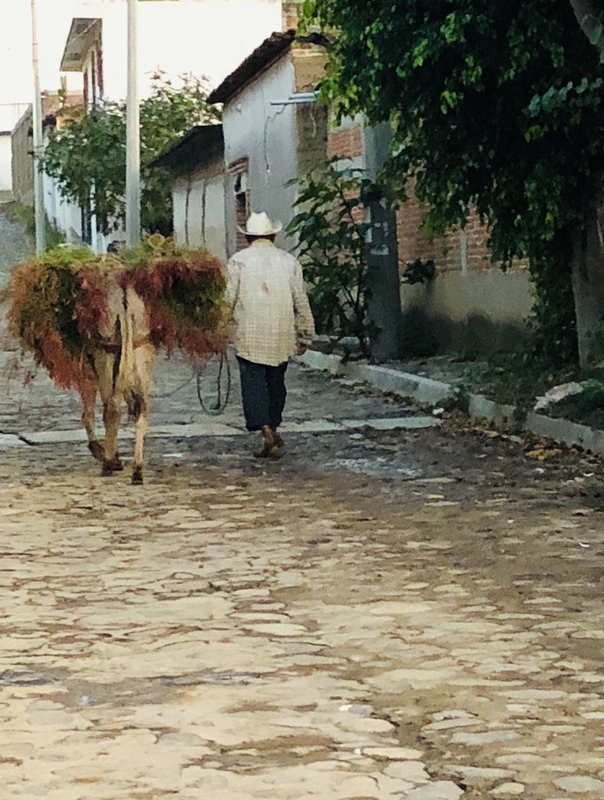 It was close to eight o’clock this morning when I set out to the campo, the wild, unpopulated area of the village, beyond the pale of settlement. The sun was warm on my back. There was a breeze. The day was promising. My three dogs were with me, Butch close to my heels, always guarding. Mamacita out in front. Tia running off after birds and rabbits, stopping from time to time to turn around and check my progress. 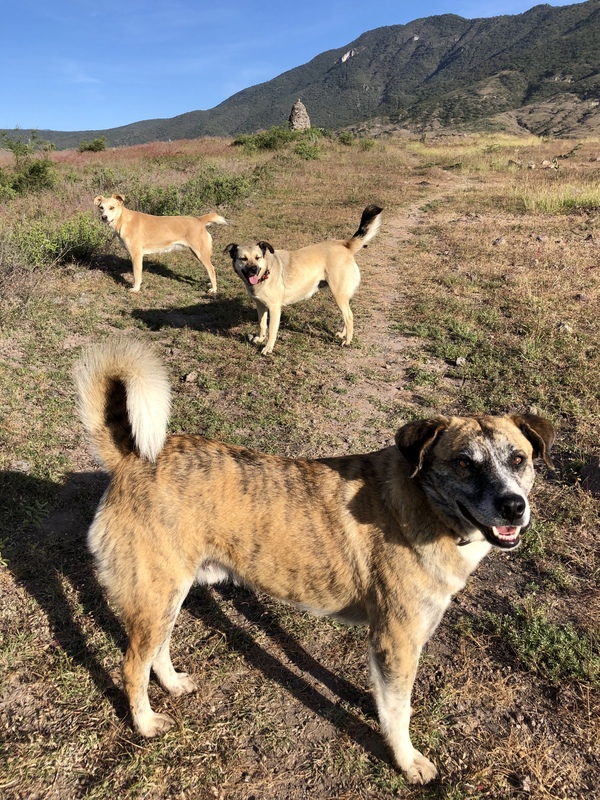 These are campo dogs, rescue dogs, dogs who have learned to be obedient and stay close. This was a day of exploration. 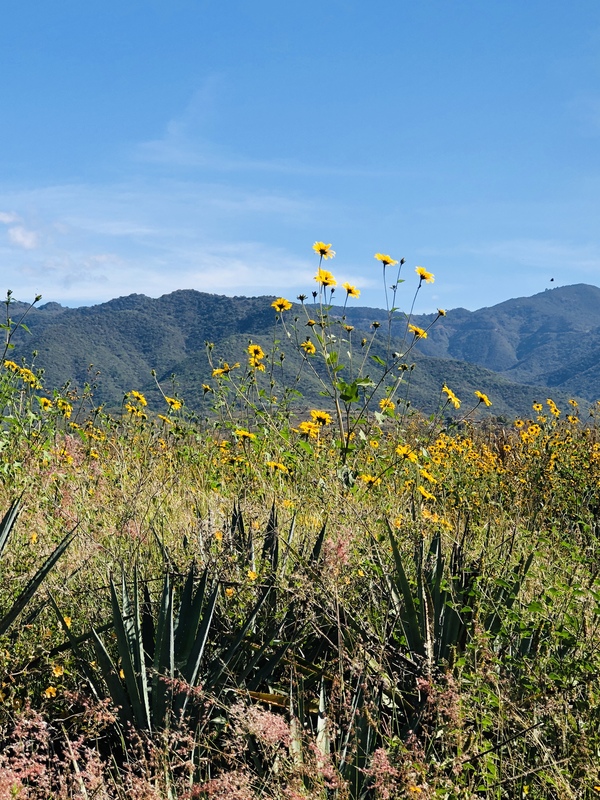 I went far beyond where I usually go along the narrow foot path ascending toward the mountain range that is a backdrop to Teotitlan del Valle, part of the Sierra Madre del Sur. 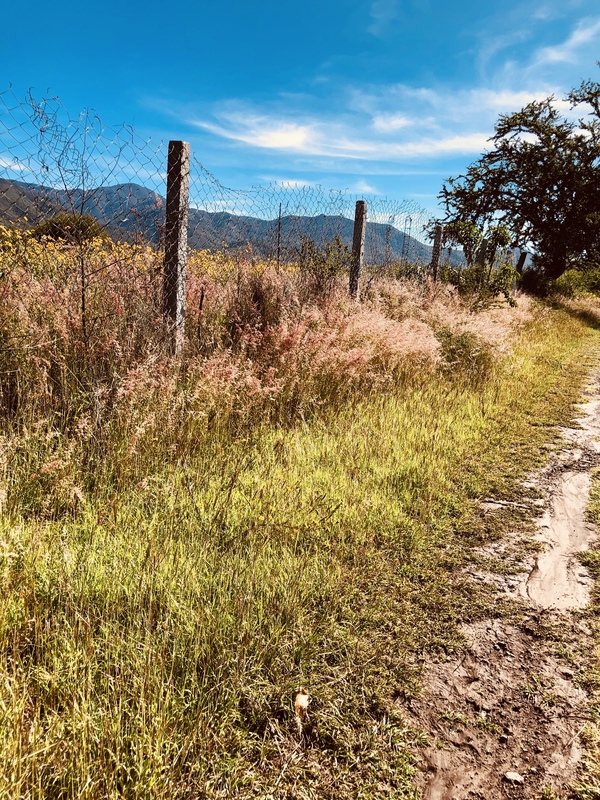 I imagine this to be an ancient trail, the border between our village and the two adjoining us — San Mateo Macuilxochitl and Santiago Ixtaltepec, that the locals call Santiguito. As I made my way along the incline, I was careful not to stumble on loose lava and sedimentary gravel. Rock outcroppings offered natural stepping-stones. 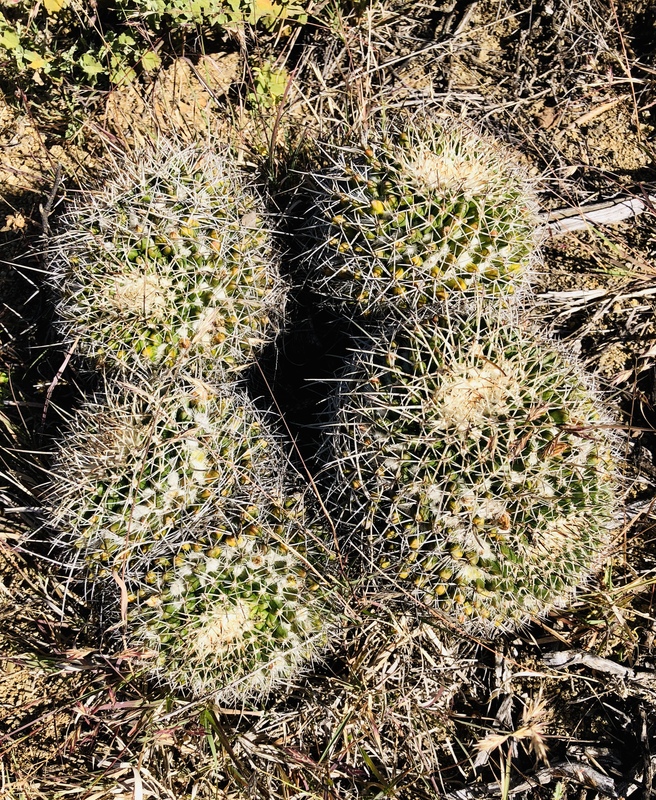 Moonscape-style cactus off the beaten path. Baby Biznaga? There are three border markers along this route. I had never been to the third. It was glorious out. I figured, Why not? Life begins at the end of your comfort zone, I reminded myself once again. Let’s figure out where this goes. 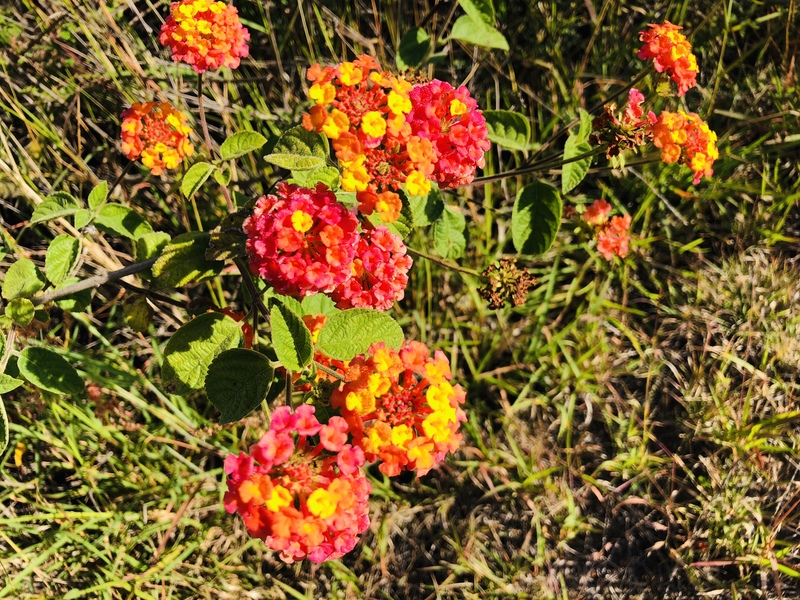 A bouquet of lantana by the roadside, growing wild here. As we reached the third, I could see there was no path up to it, so I made my own switch back path to scale the hill. The dogs followed. 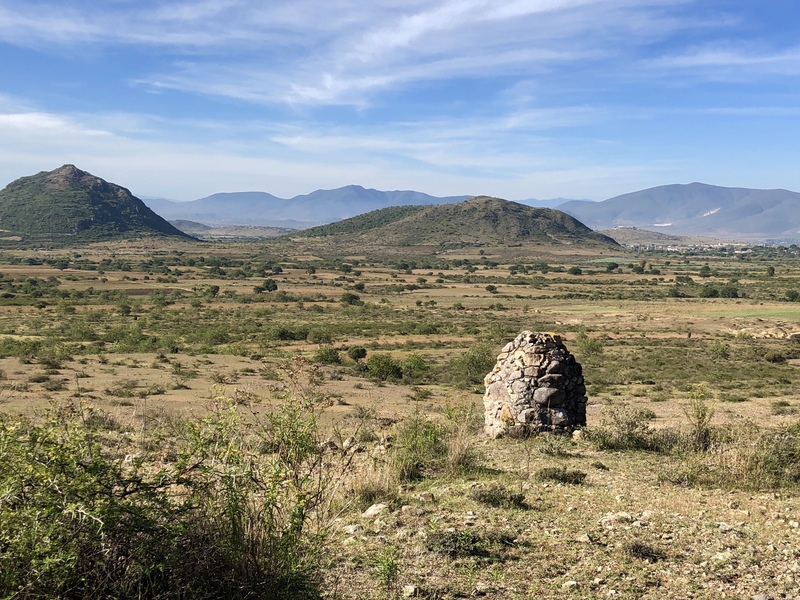 A ridge of rock offered me a natural seat from which I could see across the valley to San Jeronimo Tlacochuhuaya, beyond Santiguito. A perfect spot to meditate. I imagined those who came before me, centuries past, who sat in this very place, keeping a lookout on the landscape below. In the distance, cooking fires curled skyward and a red-shirted farmer grazed his bull in the lush fields. 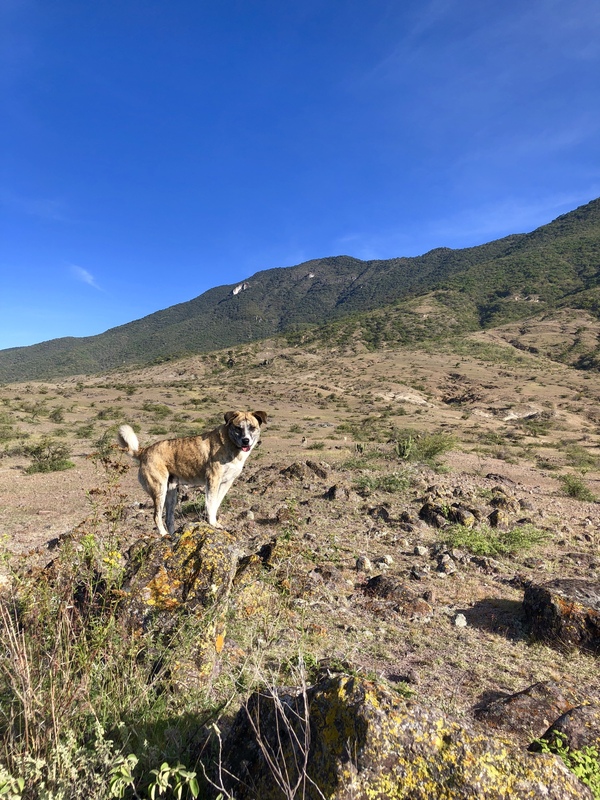 Downhill was easy, with a stop at the natural spring for quenching thirsty dogs. 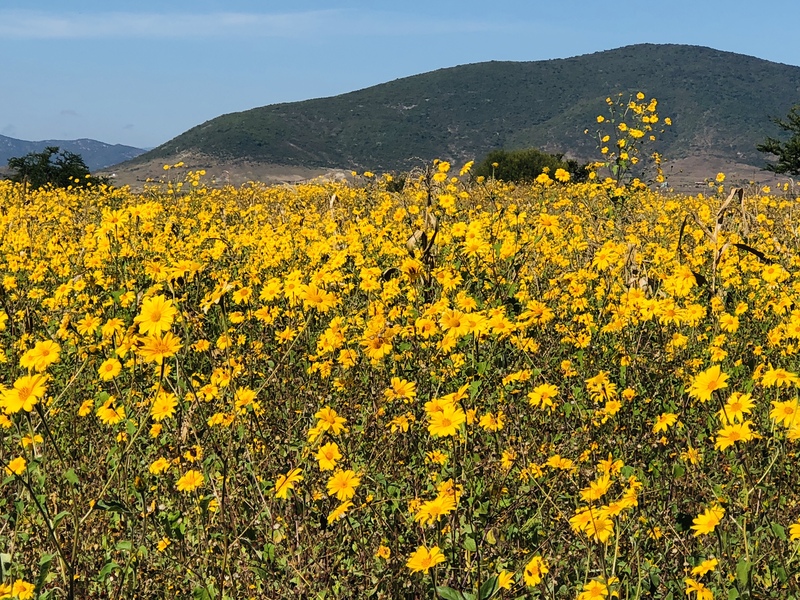 Then, a brisk walk home on the back road lined with dried corn stalks and wild marigold fields lining the road. Today, a group of Estadounidenses will gather at Los Danzantes for a special Thanksgiving meal after a mezcal toast at the home of my friend Shannon. An adjoining table is with NC restauranteurs who are opening a Oaxaca destination at the Durham Food Court, two blocks from my apartment. 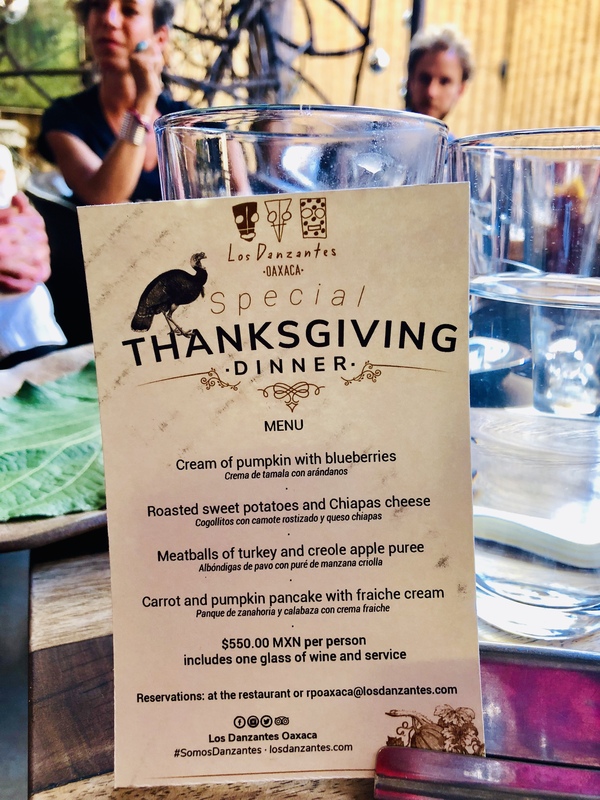 Thanksgiving menu at Los Danzantes, not traditional! Today will be a change-up from years past. I won’t be cooking. Neither will Kalisa! (I hope.) Instead of sliced, roast turkey, stuffing, gravy, mashed potatoes, Jacki’s fabulous cranberry sauce, and an array of pumpkin pies, it will be turkey balls and pumpkin pancake at 7 p.m. Nothing traditional about this year for me! I’m reminded by my friend Betsy, an Anthony Bourdain afficionado, who said, Travel is the gorgeous feeling of teetering in the unknown. And, my friend, Madelyn, who says, Take life with the wind at your back, moving forward, rather than fighting the headwinds that always set you back. Happy Day for Giving Thanks. The altar is complete. 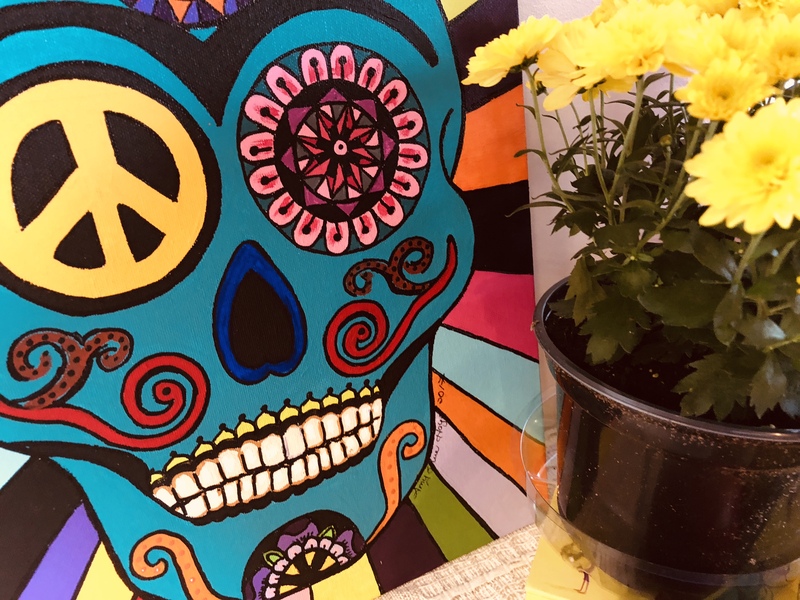 Dia de los Muertos — Day of the Dead– 2018 has passed. 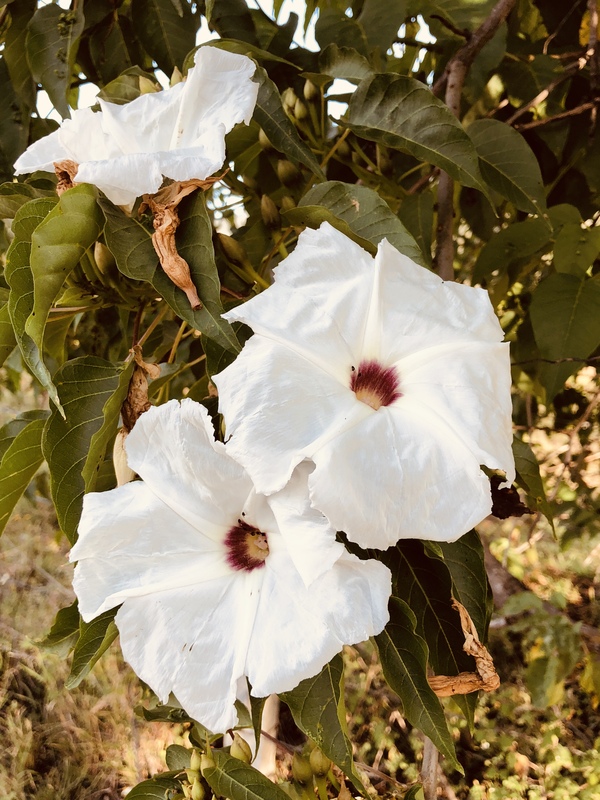 The difuntos, spirits of the ancestors, have returned to their resting places content that we have welcomed them back to earth for the day to celebrate their lives. Some of us talk to our parents, ask their advice, admonish them for shortcomings, appreciate the gift of life. Mexicans know how to honor their generations with this day that is considered more important than any in family and community life. 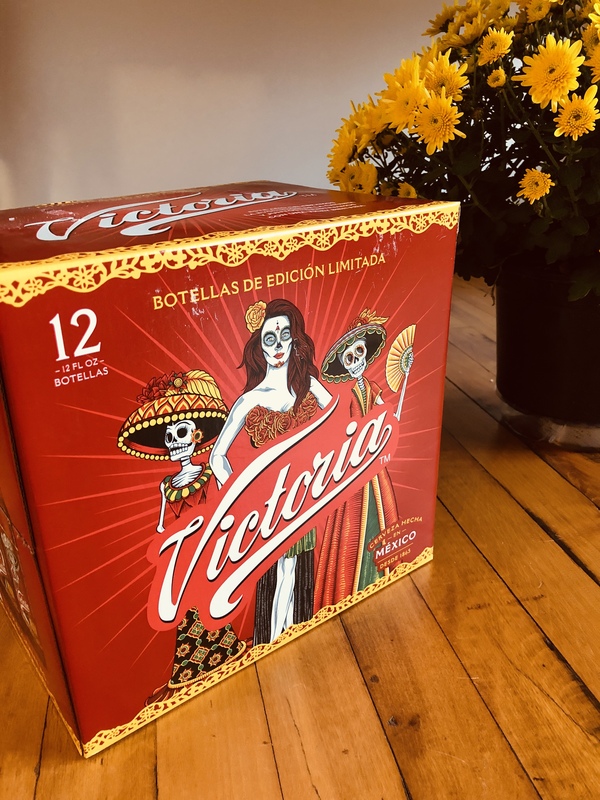 El Dia de los Muertos is the homecoming of the spirits of the dead all over Mexico, a reunion of the dead and the living. The old ones say that when the spirits come back to the world of the living, their path must be made clear, the roadway must not be slippery with the wet flood of human tears. The Calavera Painter clay figure above is for sale. $75 USD plus $8 mailing. I am not attempting to appropriate a culture that I haven’t been born into. 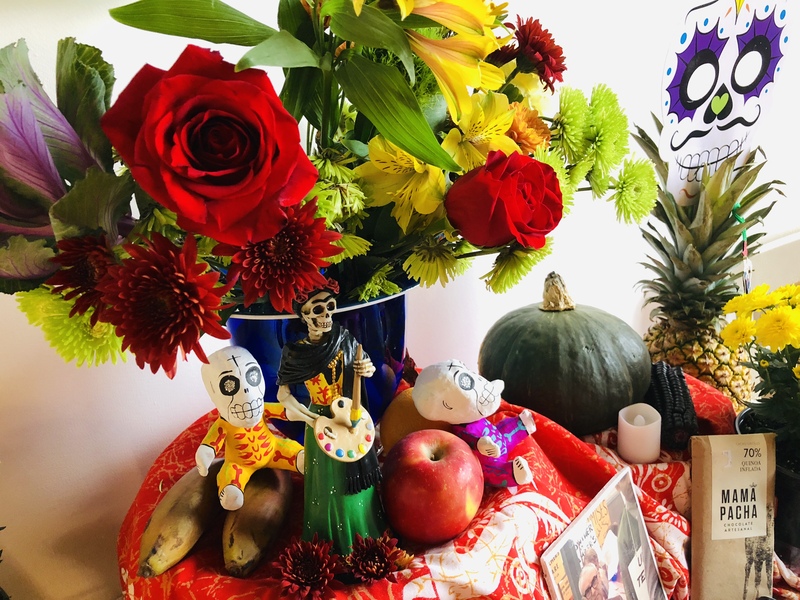 I participate and create Dia de los Muertos to learn more about how to accept the transition from life to death and the continuum and cycles of life. It is a devotional practice like meditation and prayer. Finding comfort is essential for the human spirit. Last night, a few friends gathered here at home in Durham, North Carolina, to pay tribute to those who have gone before us. Mostly parents and grandparents. They brought photographs to place on the altar. Photographs, a recent phenomenon, help us remember. In Teotitlan del Valle, photos were not placed on altars until the 1960’s. It is said that after two generations, memory of a particular person is lost. Storytelling, recalling favorite foods, jokes, clothes, activities was and is essential to remembering especially in the absence of visual clues. We sat around in a circle sharing our memories, comparing how we prepare for death and dying here in the USA with Mexico. 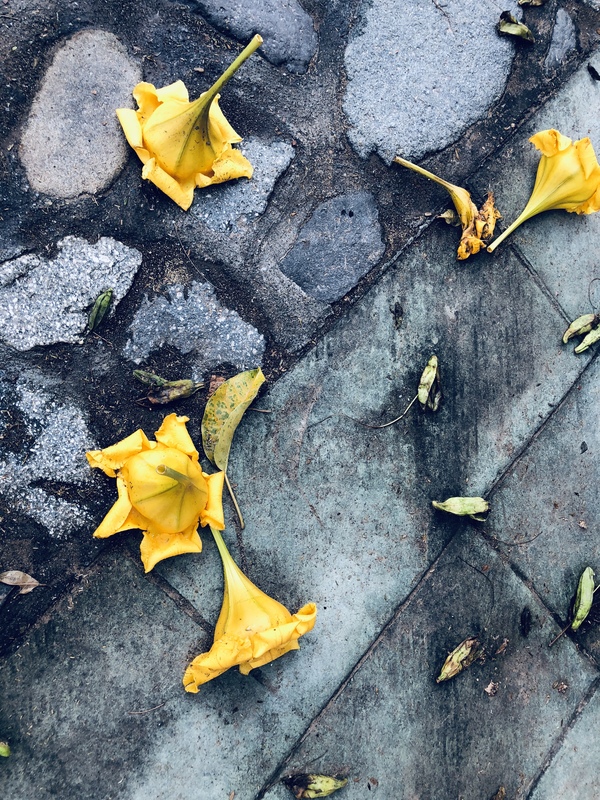 Of course, this depends on our personal upbringings and spiritual beliefs, and whether there is any ritual associated with remembering those who died. 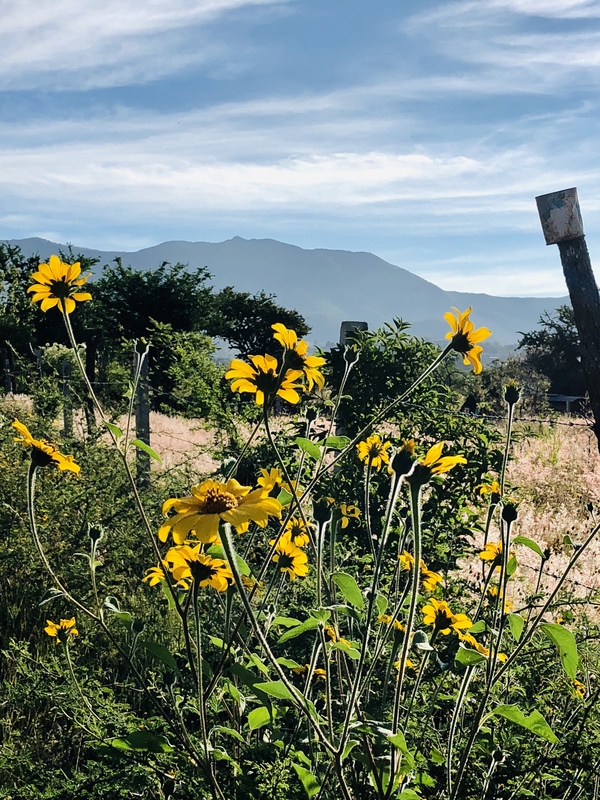 I could imagine, as we sipped wine, beer and mezcal, ate tamales and enchiladas, and told stories of mothers and fathers and grandparents and siblings, that we could have sat around a family gravesite in Teotitlan del Valle, laughing, bringing up tears and feeling connected — to each other and to those who passed on. We told stories about the love of music, literature, eating and drinking, a good joke, growing up on humble southern farms, sprawling suburbs, gritty city centers, of immigrant and refugee families, of missing a sibling to reminisce and remember details. Someone said that one never recovers from the loss of a mother, another that her father was the most important support in her life. We were real, talking about function, dysfunction and love. 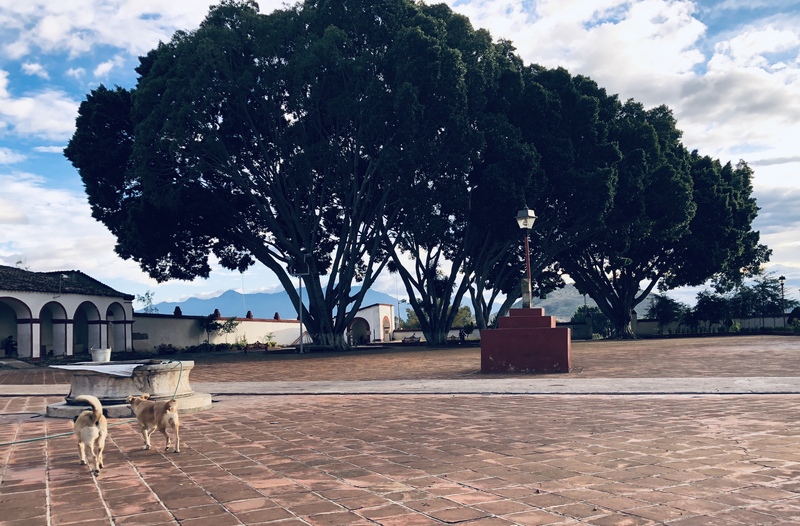 Next year, 2019, I will be in Teotitlan del Valle, Oaxaca, with Professor Robin Greene. We will be leading the Day of the Dead Women’s Writing Retreat. A year away and we are half-filled — five spaces open. Will you join us? 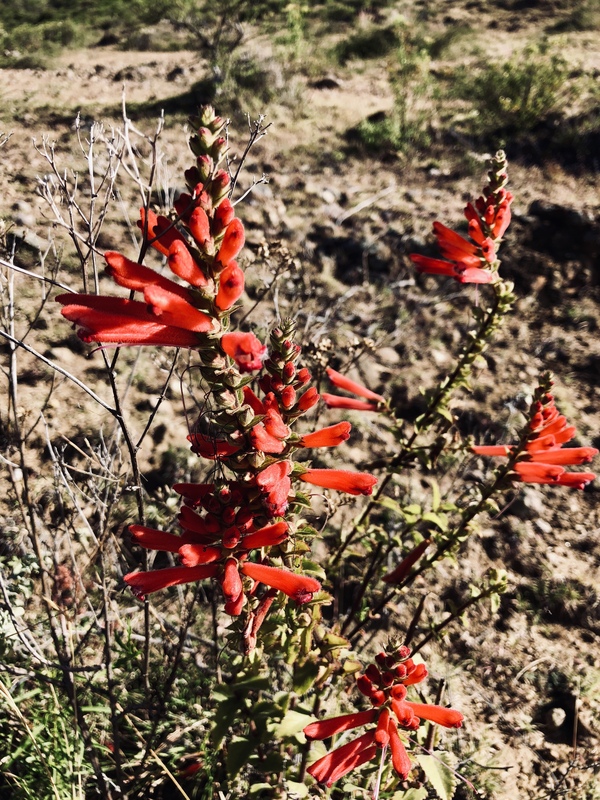 The Aztecs, I read, believed that death fed life, that human sacrifice was necessary to feed the earth to make sure there is enough rain, fertile seeds and soil, an abundance of food. Death was not feared but celebrated, honored, even welcomed. 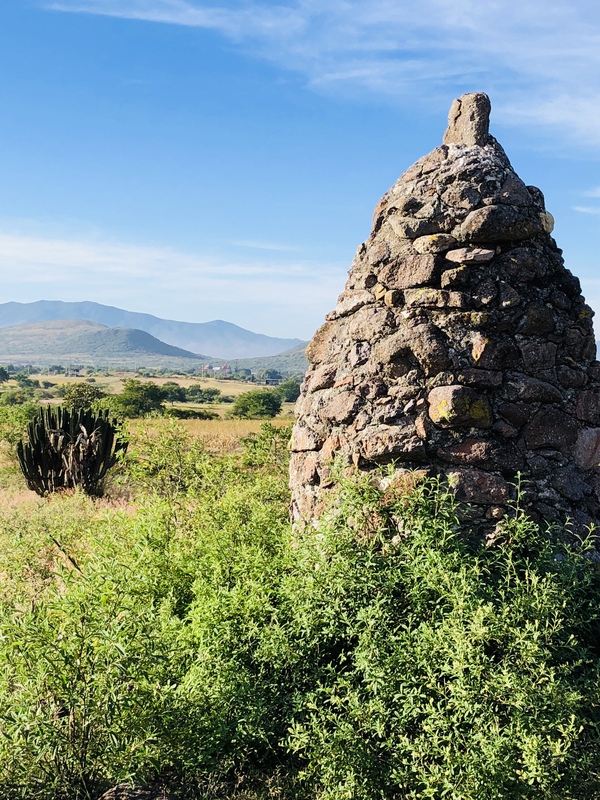 Zapotecs practiced ancestor worship and buried their dead in the courtyard of family homes so they would be close and could consult with them regularly. Bones are swept aside every ten years to make room for the next ancestor in the same resting space. This is still common in many villages. I honor my parents and grandparents by remembering them. Sometimes, I feel they are with me, especially when I am saying or doing something that is exactly as they would have said or done it (or so it feels). I think about my own mortality and try not to be afraid, to accept the natural order of life that is synonymous with death. Will I live on? Yes, in the memories of my family and those I have touched. Is there comfort in that? Perhaps. 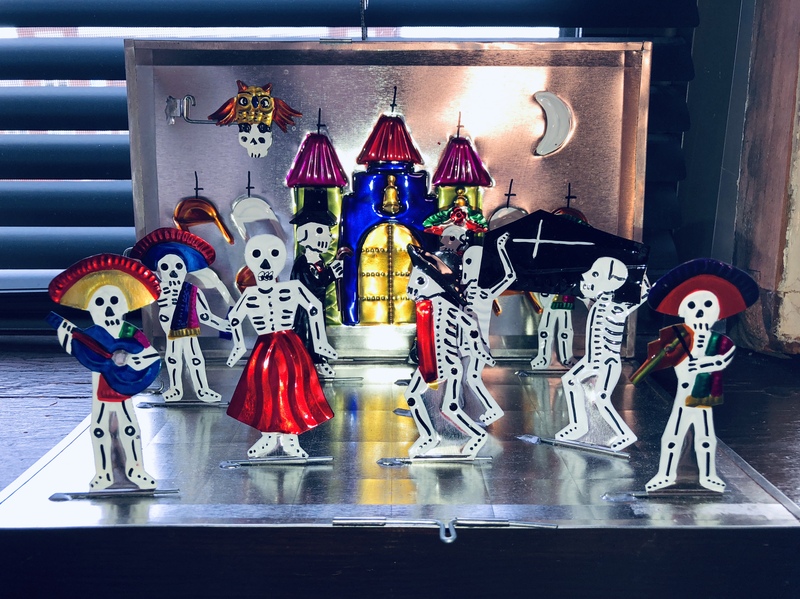 Day of the Dead diorama, tin, handmade. For Sale. $85 USD plus $8 mailing. Folds flat. 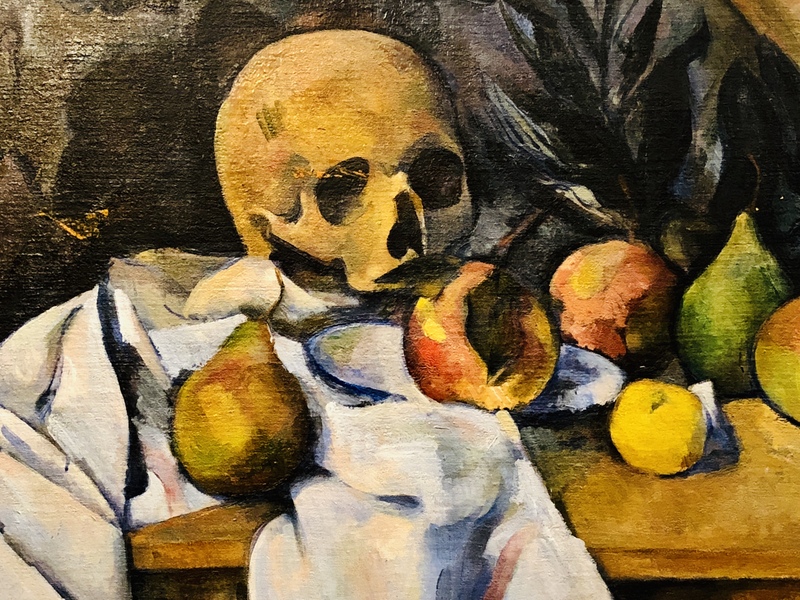 As we search for meaning, for connection, for intimacy, Day of the Dead gives us pause to examine our own lives and those who came before, those who gave us life, and to ride the tailwinds and not fight the headwinds. Do you observe Day of the Dead? Where? How? 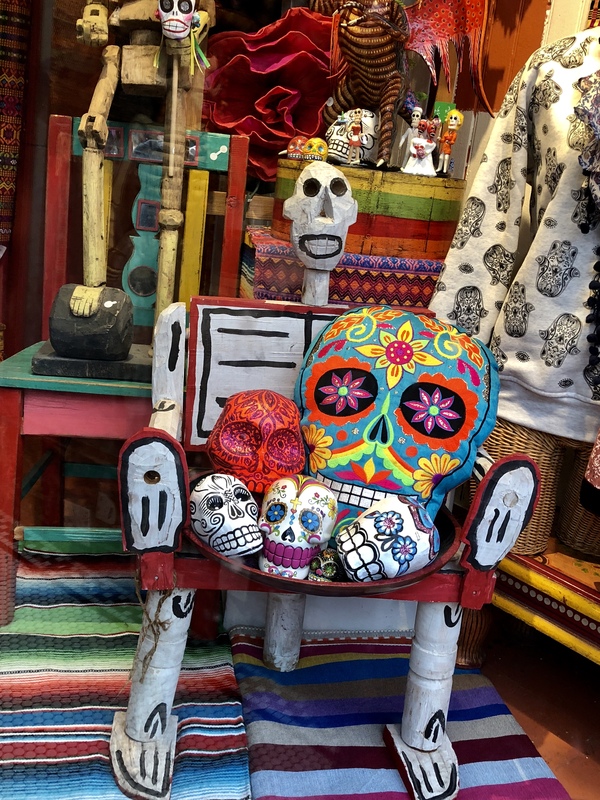 Day of the Dead — Dia de los Muertos — Is it Halloween? Today is Halloween in El Norte, the northern part of North America aka USA. In southern North America aka Mexico, the celebration is very different. 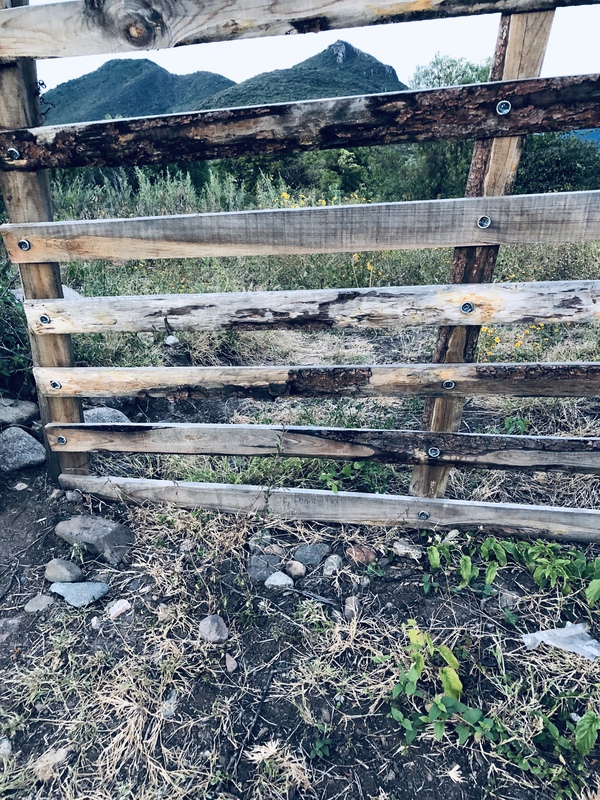 And, the border is more permeable so iconic images of carved pumpkins, witches on broomsticks, and the call of trick or treat are becoming part of the Mexican holiday landscape. 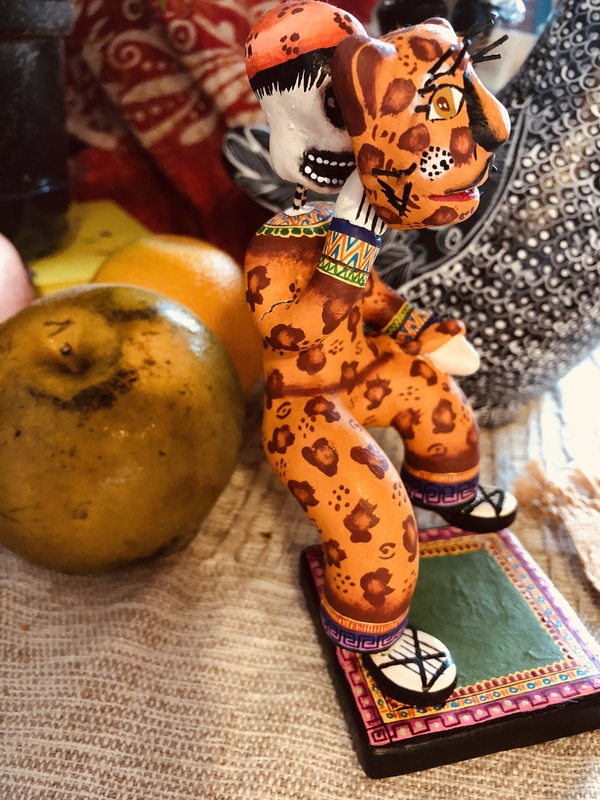 It is likely the Spanish moved indigenous ancestor worship celebration and traditions to these dates to coincide with teaching the new religion. 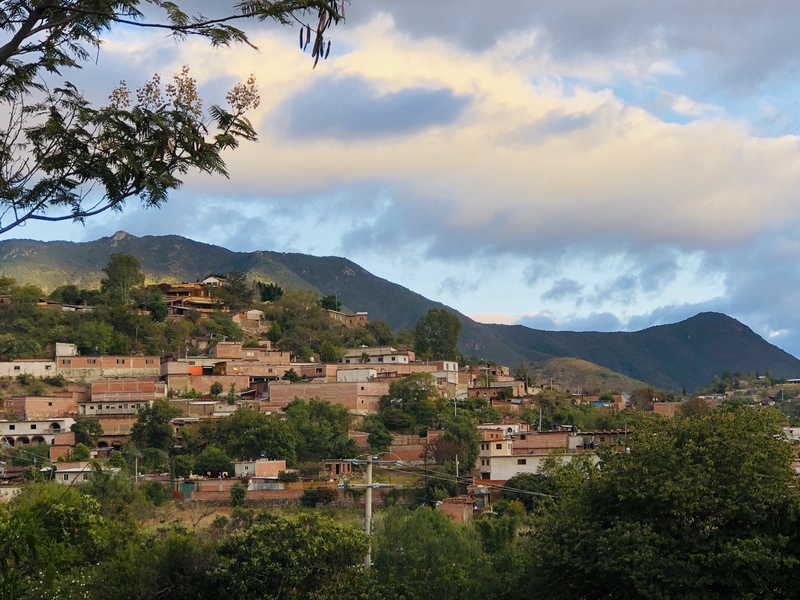 In many Oaxaca villages, the celebrations occur on one of these three days. You need to know where and when. 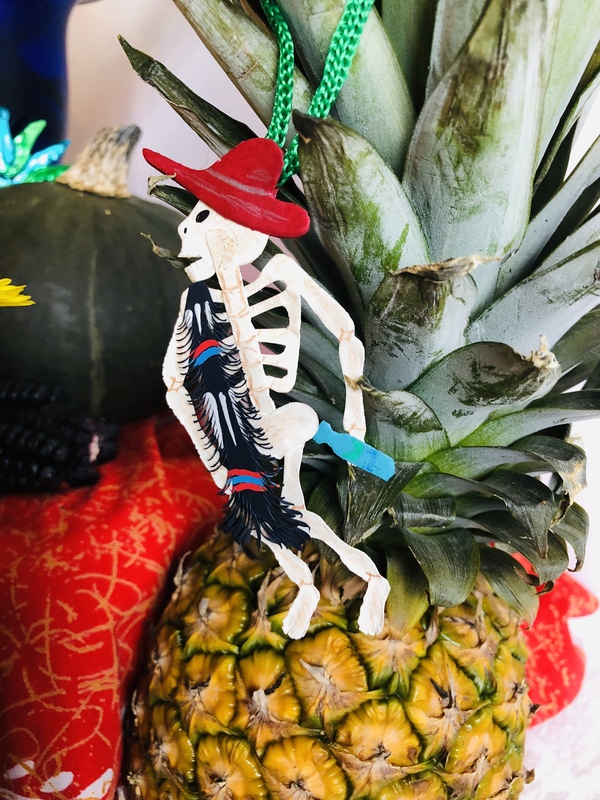 Here in Durham, North Carolina, Day of the Dead or Dia de los Muertos, takes on the flavor of Mexico and is celebrated beyond the barrio. I suspect that many cities and towns with Mexican and Central American immigrants have incorporated the images, if not the practices, of Muertos into Halloween. My annual celebration is on November 2, All Soul’s Day, which is when Muertos is observed in my Oaxaca home village of Teotitlan del Valle. I build an altar. 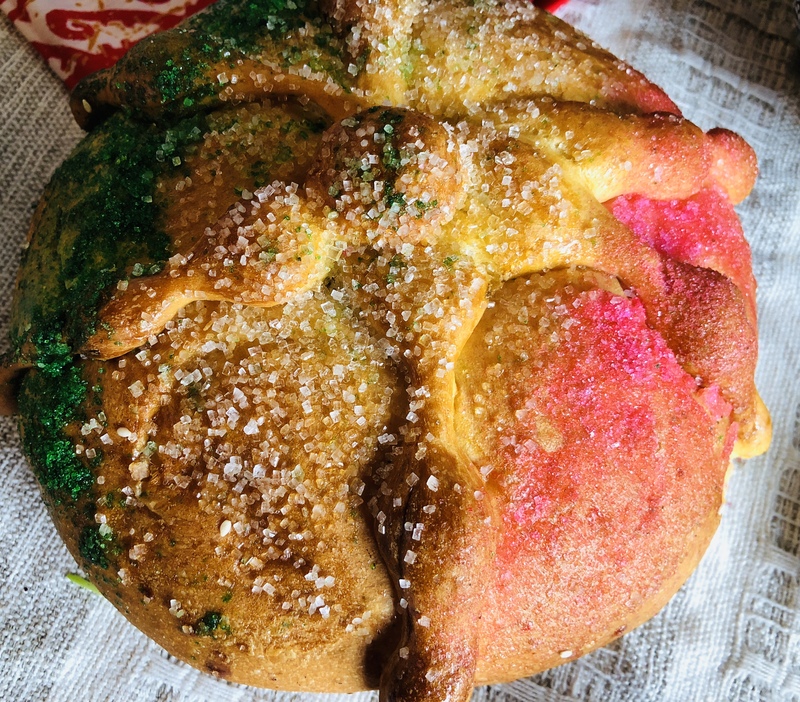 Decorate it with cempasuchitl (aromatic marigolds), offerings of food and beverages that my parents loved. My dad gets a beer. My mom gets green tea. There is bread and chocolate — a requirement. No bagels and lox in Durham, so I make do with something else. I light candles. 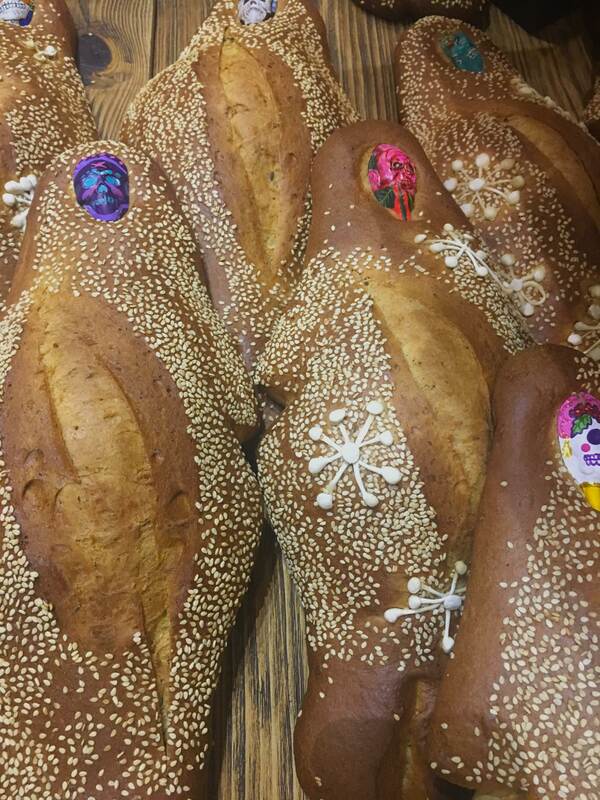 Arrange the sugar skulls. Put their photos on the table. Sit and remember. This is ecumenical. 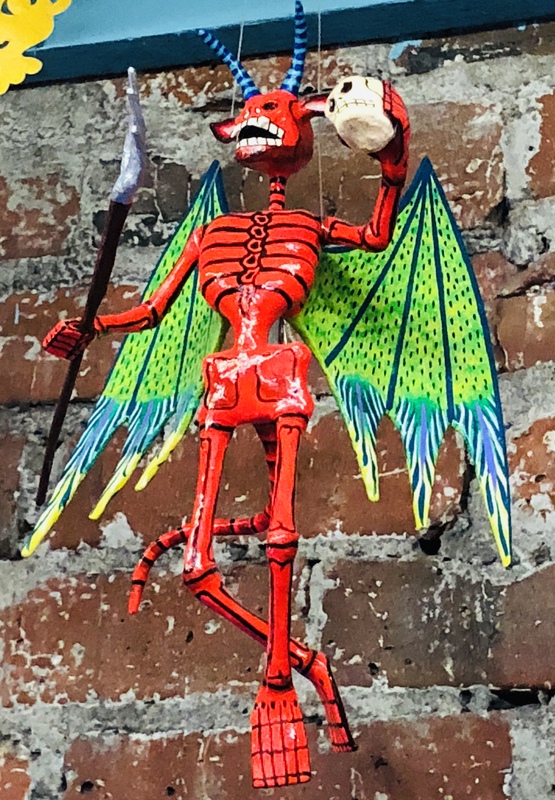 Death in the Mexican culture is synonymous with life. It is a time to celebrate life in all its forms and think about the continuity. Muertos is when the loved ones return to visit. It is a chance to talk to them, to thank them, to honor them and to consider how they gave us life. If we had unresolved issues, we can discuss those with them, too. It is very healthy and healing, like a prayer. Here are some links of past blog posts I have written over the years that explain Day of the Dead. Please feel free to read and pass along. Lots of photos in these links, too! Let us know how you will celebrate and remember. 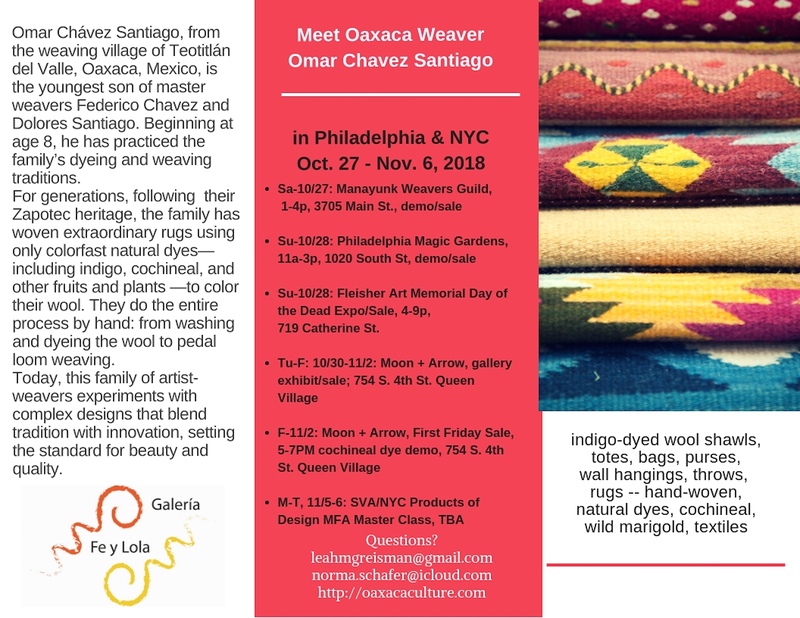 Oaxaca Rugs in Philadelphia, Pa.
Omar Chavez Santiago from Galeria Fe y Lola in Oaxaca is traveling with me to Philadelphia, Pennsylvania at the end of the week to start a series of rug exhibitions, sales and natural dye demonstrations. Events start on Saturday, October 27, 2018. We hope if you live in the region you can stop by. On November 5 and 6, Omar will be in New York City — his first time to the Big Apple. We will confirm dates, announce location and time soon. Huge thanks to Leah Reisman, Ellen Benson, Suzanne Bakewell and Kathleen Bakewell for organizing Omar’s visit. They made it happen! We hope to see you. I’ll be there the first weekend. Stop by to say Hello! Please share so we can give Omar a big Philly welcome. It’s his first time there. If you want a PDF flyer, send me an email!